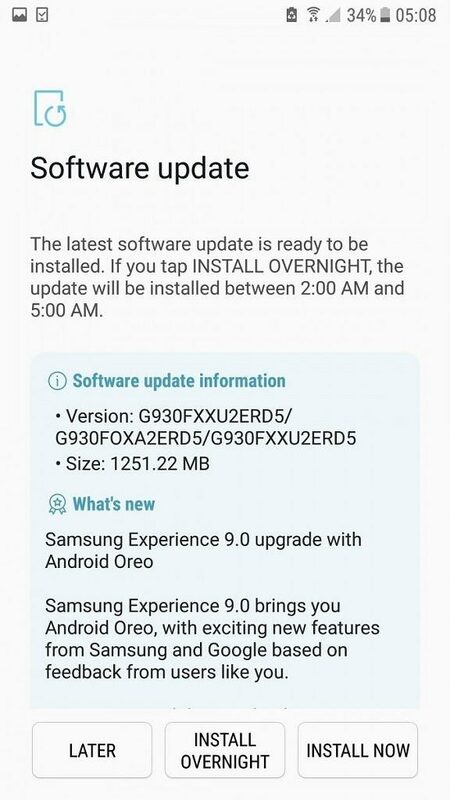 Update: Another stable official Android 8.0 Oreo OTA update is rolling out for the Samsung Galaxy S7 and S7 Edge with firmware build numbers G930FXXU2ERE8 and G935FXXU2ERE8 for the global variants. You can download all the firmware builds using the following method. Following Galaxy S8, S8+, Note 8, and some A-Series 2017 Editions, it is time for the Galaxy S7 and S7 Edge’s Android 8.0 Oreo upgrade based on Samsung Experience 9.0. The US variants of S7 and S7 Edge are already being updated to Oreo OTA. This includes the AT&T, Verizon, T-Mobile, and Sprint variants. Now, the global or international variants are receiving the same with build number ERD5. 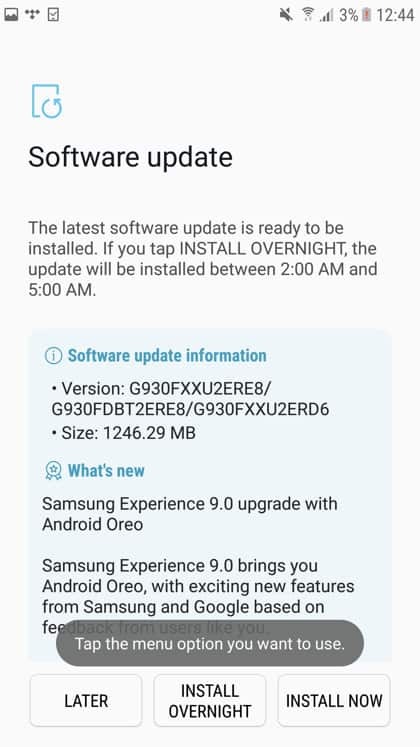 The old Oreo update for the S7 and S7 Edge devices with Baseband versions G930FXXU2ERD5 and G935FXXU2ERD5 have been abandoned and new OTA update is rolling out with build ERE8. MOre details include G930FDBT2ERE8/G930FXXU2ERD6. The OTA is currently rolling out in European region with the UK unlocked variants being the first ones. It won’t be too long until other regions receive the same update. As the Oreo update is for the global variants, soon all the models of S7 like SM-G930F/FD and SM-G935F/FD will receive the same. You may also like to download Snapdragon Galaxy S7, S7 Edge, and S7 Active Android 8.0 Oreo OTA update. There are multiple ways to update your Galaxy S7 to Android version 8.0. If you like you can directly download the full stock firmware CRD5 for the S7 from Samsung Servers and install it using the Odin software. This is a recommended approach because it will do a clean installation and factory reset the phone at the same time. This will make your device as good as new and is highly recommend to wipe data after every new Android version upgrade. Alternatively, we will take your device to the last available Android 7. Nougat firmware build and then check for any software OTA updates available. 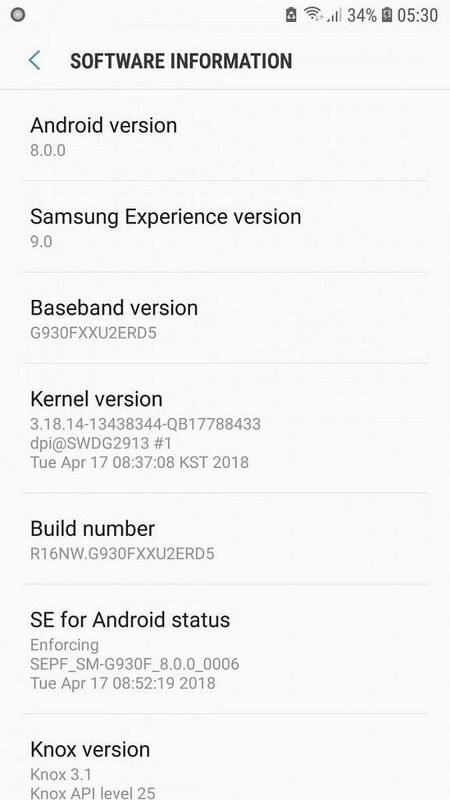 So download and install the latest Android 8.0 Oreo based Samsung Experience 9.0 firmware onto S7 device. See how to capture OTA updates. In order to capture the OTA update, make sure your device is on the previous Baseband version G930FXXS2DRC3 or G935FXXS2DRC3 on Galaxy S7 or S7 Edge. Once done, you will receive an OTA update. How to download Samsung Galaxy S7 and S7 Edge Oreo stock Odin firmware? This tutorial will help you download the latest available full stock firmware update onto your Samsung Galaxy S7 and S7 Edge. Download and extract SamFirm tool to your PC. Download the latest stock firmware for Samsung Galaxy S7. Now, head over to this tutorial for installation: How to restore Galaxy S7? Or, see below. Verify your device for compatibility. Check out the download section. Enable OEM unlocking, Advanced reboot, and USB Debugging on your device from Developer Options in the Settings. Make sure you have latest device drivers setup on your PC for a better connection. Get it from the download section official from the manufacturer. Backup everything before you proceed. Odin performs a clean install, that you will lose apps, data, media, etc. Step 3: If you already have Odin software on your PC then simply run the Odin3.exe file. If not, then download the Odin3.zip file from the download section and extract it. Run Odin software as administrator. Step 6: Now click on AP button and add the firmware file by navigating to the file path. Be patient as first boot may take a while. To get 4G VOLTE on your S7 or S7 Edge, such as the Jio VOLTE, you will need to root your device, install TWRP, and flash the following zip file. Make sure your Samsung Galaxy S7 or S7 Edge device is rooted. 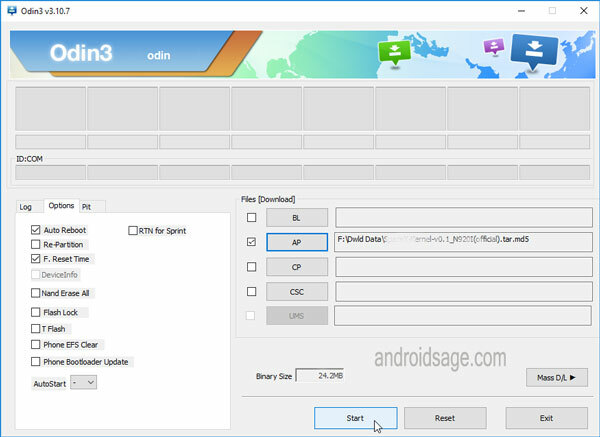 Flash latest TWRP RECOVERY twrp-3.1.1-0-herolte. Tap on wipe option and do a format data. Now, flash the CSC zip from this link. Download Samsung Galaxy S7 and S7 Edge stock full Oreo firmware for SM-G930F, G930T, G935P, G930W8, SM-G935FD, SM-G935F, SM-G935FD, SM-G935W8, SM-G935T.